Synopsis- When a girl that social worker Kari Marchant places in foster care is brutally murdered, she’s compelled to learn why. Her quest for the truth pits her against friends and coworkers. As Kari works to solve the horrific plot, more people die. She’s been targeted for death and she doesn’t even know it. How far should she go to learn the truth—even if it threatens her life? 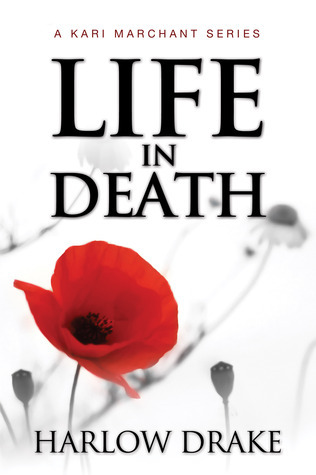 Review- Life in Death is a mystery suspense novella packed full of action and surprising twists. Kari Marchant’s life quickly becomes complicated- her ex is running for mayor, a child she places in foster care is murdered and as her colleagues begin to drop off like flies, Kari comes under the attention of Detective Nicolet and Detective Cobb. Life in Death is told from various viewpoints- Kari’s, Nicolet’s, Cobb’s and the villains. For such a short book I felt as though there were too many characters to align with and too many things happening, but it did make for suspenseful reading and a desire to find out who the villain was. When I accepted this ebook for review I was actually of the belief that this was a romantic suspense novel as the synopsis is set up to entice the reader about Kari and Nicolet’s conflicts. When I began reading, the tension and conflict between Kari and Nicolet was set up instantly and I hoped to see this develop. Unfortunately, I realised right near the end when there was quite an unexpected turn in the novel that romance wasn’t actually on the cards for Kari after all. My expectations of this novel slightly tainted my enjoyment, but had I been aware of the premise at the outset I’d still have enjoyed the intriguing plot lines, the fast-paced storyline and the tension. There were parts that weren’t as developed which is understandable given it’s such a short book, but I really loved that it was a quick book with enough intrigue to tempt me to read on if further adventures for Kari were written. Life in Death can be purchased from Amazon. Jayne, thank you for your thoughtful review of my book. I’m so glad you enjoyed it. Cheers!